The project "I have PID. I am not alone" developed to veil for the emotional well-being and the quality of life of PID children, has treated 75 patients and 157 relatives during 2018. 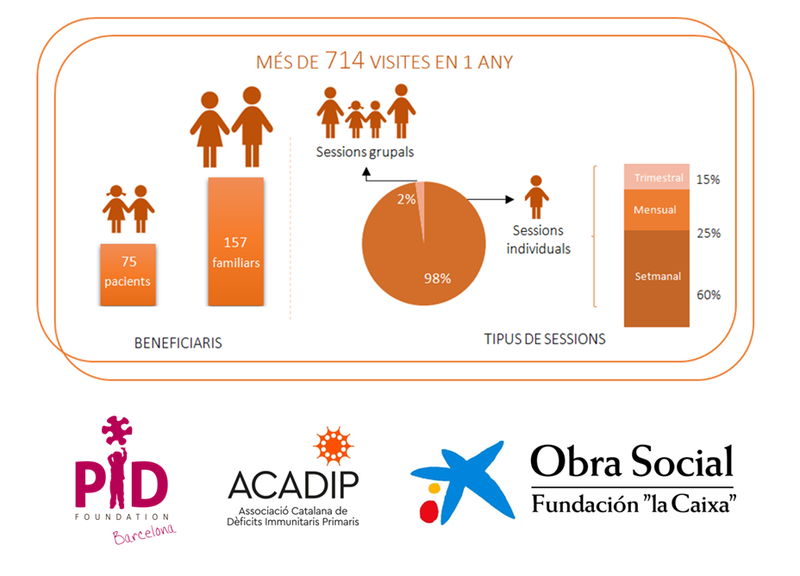 A total of 714 visits were made to accompany the process of living with a chronic illness and to cover various needs of immunodeprimed children and their families. - A visit to the immunology laboratory. - A body expression workshop. Within the program The PID in schools we have done interventions in 3 educational centers of our patients. The project was carried out within an integrated support model and coordinated with the interdisciplinary team and with the two entities involved; ACADIP and the Barcelona PiD Foundation, and it has been possible thanks to the collaboration of "la Caixa" as well as the support received by the Generalitat de Catalunya and the Barcelona Council. The overall assessment has been very positive on the part of all participants. Being able to attend to the psychological and personal dimension of patients and their families has allowed a better acceptance of the diagnosis, has optimized the adherence to the treatments and, therefore, has optimized the quality of life of the children.